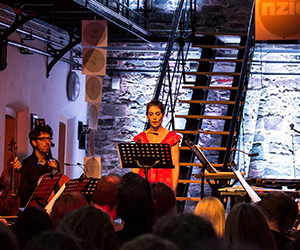 The festival began in the narrow confines of Dundalk Gaol with an evening of Jürg Frey’s music. It opened with As imperceptibly as grief, a setting for solo soprano of Emily Dickinson’s poem, and in hindsight it was this opening song that carried the greatest weight of the concert, though not due to anything radically different about its music. As one might have expected from Frey, the piece unfolded in a calm, unhurried manner. Initially, the space was ‘setup’ via the soprano – Hélène Fauchère, in a tour-de-force display of infinite control – slowly placing evenly-spaced quasi-isolated notes in the air. Two ‘parts’ were present: syllables of the text on one pitch, open vowels a semitone higher, an oscillation that soon became more melismatic. As in many of Frey’s pieces, it was permeated with a sense of profundity, one that was heightened by these moments of melisma. At one point in particular (before the text moved from the afternoon to dusk), the song became captivated in an extended ‘ooh’ episode that suggested pure ecstasy, as though Fauchère were caught in a private emotional reverie or possessed by a vision. On a more musical level, it displayed an intense enjoyment of sound itself, both its mere presence and its tangibility – tactility even – wanting to linger over its pitches as well as the movement between them. Having ejected its working title of The Ephemeral Opera: The Space Between, Jürg Frey’s new work for soprano and ensemble was premièred as I Listened to the Wind Again. It takes that name from a poem by the Lebanese-American poet Etel Adnan. This second song, though longer than the first, made something of a lesser impression due to various similarities in the way the music operated. On the one hand, it removed a little of the wonder that had typified that opening piece , making it now seem subject to a broader aesthetic concern rather than conveying a unique response to something specific. On the other hand, this is a minor quibble, and while the second song didn’t live up to the first in terms of emotional depth, it surpassed it in terms of its musical scope and narrative. The soundworld was established via violin and viola harmonics with bowed vibraphone notes and occasional staccato strikes on a snare drum. 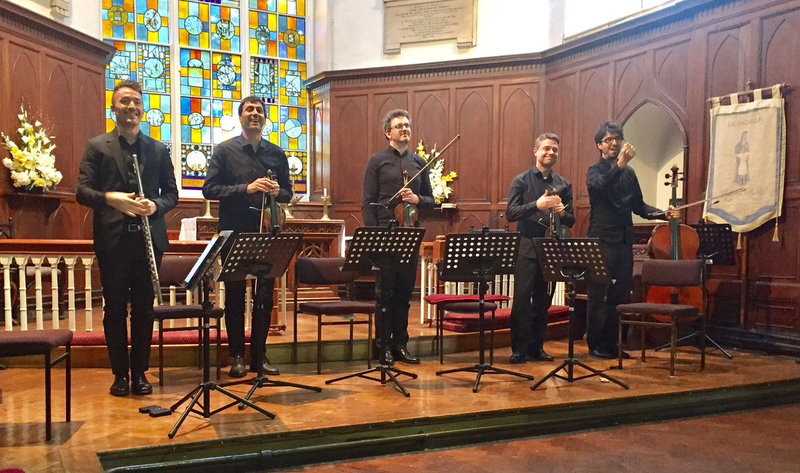 Notions of tonality were played with: slight emphasis on certain pitches lent them a cadential quality – almost establishing a ‘tonic’ – that persisted through subsequent phrases. 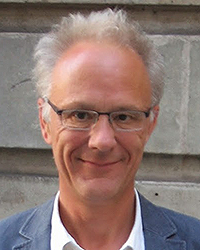 Later, Frey narrowed the harmonic bandwidth such that the music took on a superficial similarity to a Baroque chaconne (though without any strict cycling of material). Compositionally, this all seemed very careful and meticulous, yet this aspect too was equivocal. While the first song had felt utmost focused – in the best sense, ‘fixed’ – at points things here seemed more random, displaying an approach to both material and apparent indeterminacy that brought Eno’s Music for Airports briefly to mind. Yet, here and there were distinct hints of word painting, particularly at “tenêbres” (“shadows”), the music becoming wan and dissonant, coloured with bass drum impacts. This was setting up the work’s final destination, culminating in dry solemnity. There’s a phrase in Adnan’s poem that to my mind perfectly encapsulates the musical character of both As imperceptibly as grief and I Listened to the Wind Again, as well as their respective fundamental paradoxes and ambiguities: “tendre monotonie”. That first word is important: the aloof, ritualistic demeanour that one hears in much of Frey’s music was here outweighed by a palpable layer of emotion that was rather moving. 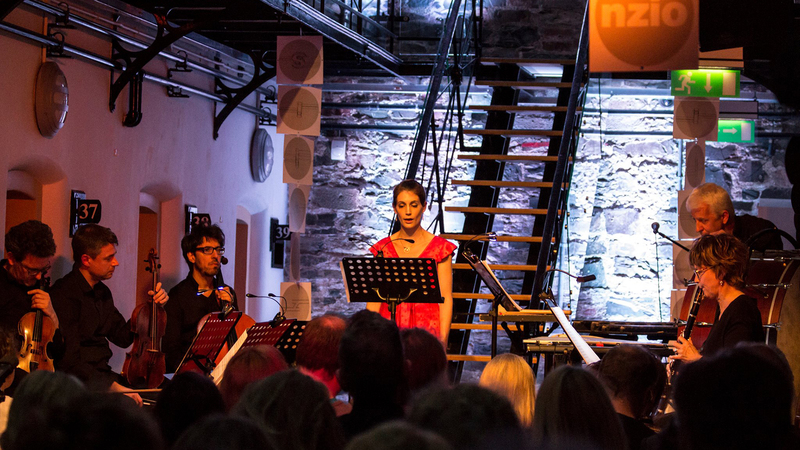 Its première in Dundalk Gaol was an outstanding performance, Carol Robinson, Trio Prometeo and Simon Limbrick projecting just the right amalgam of solemnity and feeling, revealing a palette located somewhere between monochrome and colour. 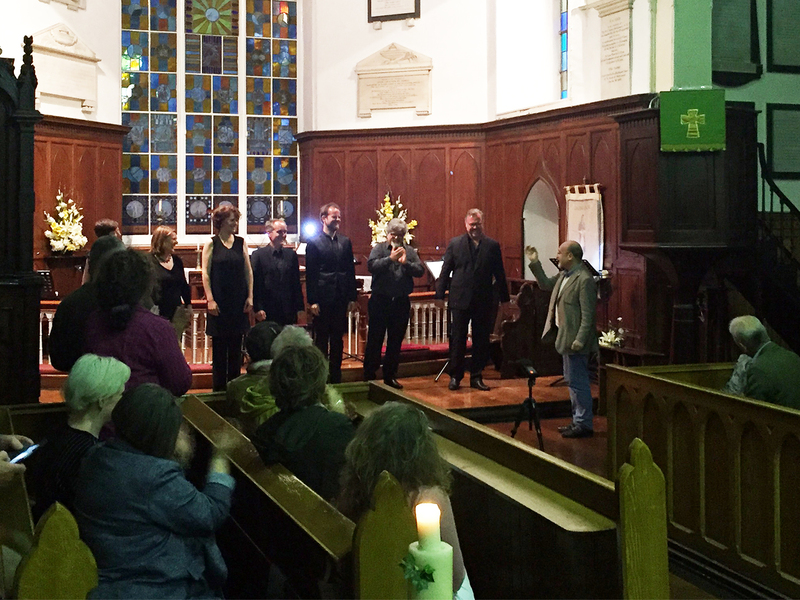 It certainly got the Silenzio festival off to an impressive start. Almost in its entirety, Saturday was occupied with the music of Salvatore Sciarrino. 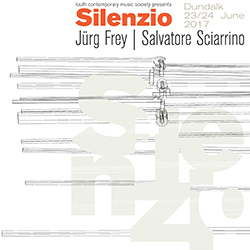 The best musical festivals have a way of undermining and challenging one’s preconceptions, and i’ll admit to having gone to Ireland under the illusion that Sciarrino could do no wrong; and then i heard his 1985 work for flute and soprano, La Perfezione di uno spirito sottile (The Perfection of a subtle spirit). The first half of its 40-minute duration was taut and electrifying: Matteo Cesari’s flute soliloquised, often at the cusp of audibility, reduced to whispers and whistles. When she finally entered, Valentina Coladonata delivered her halting words (taken from an engraving Sciarrino found in Eleutherna) in a way that immediately brought Frey’s music from the previous evening to mind: highly emotional – the opening line: “Ardo di sete e muoio” (I burn with thirst and die) – yet at the same time sober, in this case almost stern. Further comparisons with Frey came to mind due to the work’s achingly slow forward progression, though for the first twenty minutes this was a decidedly positive aspect. However, as it continued, and continued further, and then further still, the flute became stuck in ruts of incessant jet whistles – Cesari trying to make each one more ferocious than the last, the effort seeming to become almost hernia-inducing – and Coladonata’s voice, having barely moved through the words, suddenly lurched back to the beginning again. This broke the spell Sciarrino had so carefully cast: now there was something stupid about it all, no longer magical but projecting a music too terrified or lobotomised to move onward. It must be said that Cesari and Coladonata’s rendition of the piece was flawless – i’ve rarely seen two performers so entirely enclosed within the music – yet, sadly, the same certainly can’t be said of La Perfezione itself. But then, as i said, it’s good to have one’s preconceptions challenged, regardless of what truth is revealed. 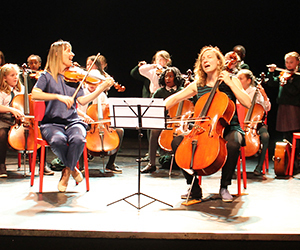 Music by other composers was featured in two afternoon events at the An Táin Arts Centre, a solo recital by Carol Robinson that took place in the bowels of the building, and a concert given by violinist Silvia Tarozzi and cellist Deborah Walker that involved local schoolchildren. The latter concert explored, as its title stated, ‘Traditional Italian Songs of Work, War and Love’, which had been reworked into new arrangements, clothing the words in more experimental music that encompassed the spectrum from lightness to abrasion. It was a shame not to have had the texts to these songs; they were quite interesting, but understanding them on a deeper level was impossible. The final song made a special impact due to the role taken by the large group of pupils from St. Malachy’s Girls’ school who, wielding assorted string instruments, created simple textures from either fragmentary gestures (think 1960s Penderecki) or sustained pitches, over which Tarozzi and Walker performed more soloistic material (based on similar materials) and sang – but suddenly, at the very end, everything stopped and the schoolgirls sang a verse from the Italian song, a capella, an unexpected and powerful moment; they fully deserved the prolonged applause for their contribution. Two other works began the concert. Cassandra Miller‘s Serenata took a somewhat hackneyed idea – exploring the pitch content of speech (think 1980s Reich) – and just about got away with it; it was quite nice to listen to, yet while many composers resort to some sort of conceit in order to fashion material, here it quickly felt like a bit of a gimmick. Malcolm Goldstein‘s Two seeking song, listening was very much more engrossing. A text-based piece, the players are instructed to devise melodies (to fit a series of supplied sentences), and then elaborate upon and ultimately improvise beyond them. Despite the stream-of-consciousness gestural soundworld explored by Walker and Tarozzi, there was a definite sense of melody at the music’s core. Put another way, we heard a strikingly lucid impression of perspective: melody as the slower-moving, deeper or background level, with elaboration and decoration skittering more rapidly nearer/on the surface. Occasions when they deliberately moved through repeated cycles of behaviour were especially interesting, apparently turning the duo into a pair of automata. 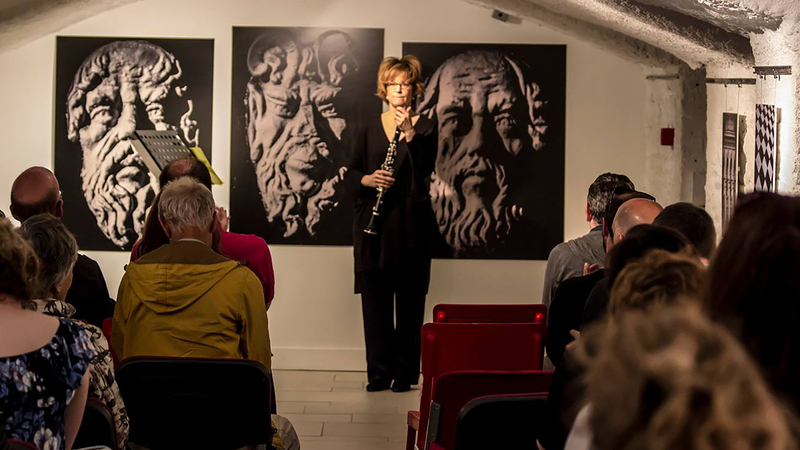 Carol Robinson‘s recital was situated in An Táin Arts Centre’s basement gallery, which at the time was kitted out with an exhibition of striking black and white photographs in conjunction with some peculiar texts that ranged from merely aphoristic to satanic to full-on conspiracy theoretical. This created an off-kilter environment for Robinson that proved entirely conducive. Indeed, it was impossible not to view her as a something akin to a sorceress, the clarinet becoming the wand-like locus of her incantatory power. That was more literally the case in two works by US composer William O. Smith. In his Meditations, Robinson turned to the four corners of the space in turn, declaring a short quotation from Marcus Aurelius before firing out assertive bursts of acrobatic material (coming right at the end of the concert, it felt a little as though the space was thus being ‘reset’). By contrast, in Smith’s Incantation calm, measured (but complex and difficult-to-control) multiphonic chords were delivered, punctuated by significant silences; all mesmeric enough as it was, but when Robinson then muttered some words in Latin, the spell was complete – by now one almost expected to see sparks emitted from the bell of her instrument. Sciarrino‘s Let me die before I wake was performed out of sight, the unseen origins combining with its barely-speaking material – full of niente articulations, all trills, tremolandi and faint multiphonics – to create music that, while undoubtedly distant, in no way felt remote. Aided by the acoustic of the basement gallery, the sounds seemed to creep around us like tendrils of vapour, and a brief stronger section was immediately pulled away from, making the piece seem ruin-like or palimpsestical, exploring the remains of an impression left by something that once was tangible. Fantastic. Most potent of all, though, were a pair of works by Giacinto Scelsi, both from 1956: Ixor and Ixor IV. Scelsi forces one to grapple with abstraction in a way that’s entirely unique, always managing to give it an immediacy that takes you unawares. In other words, you feel you ‘understand’, yet any attempt to articulate this understanding would only lead one back to abstraction again. This was entirely the case in both these pieces, the first once again casting Robinson in the role of a maker of magic, this time of a more alchemical persuasion and clearly involving much more tiring exertion. Ixor IV answered this with a no less arduous barrage of raw, muscular energy. At the end of both pieces, Robinson let out an immense exhausted exhalation; i suspect we all knew – and empathised with – exactly how she felt. 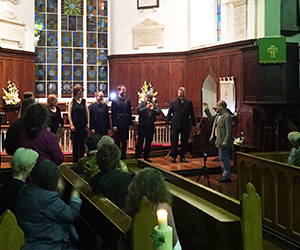 The Silenzio festival didn’t so much draw to a close as go out with an almighty rush on Saturday evening, in Dundalk’s grand St Nicholas Church of Ireland. 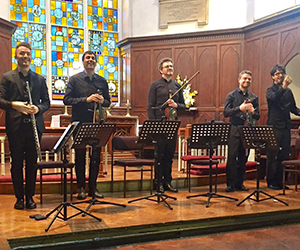 This was another concert devoted to Sciarrino, bringing back Matteo Cesari and the full compliment of Quartetto Prometeo (having been just a trio earlier) together with one of new music’s most spectacular vocal ensembles, Neue Vocalsolisten Stuttgart. 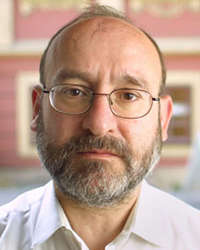 In a change to the programme due in part to ongoing wisdom tooth issues, Cesari replaced Sciarrino’s 1984 Hermes with a much more recent solo flute piece, Immagine fenicia, composed in 2000. The jet whistles that felt like an infection earlier in La Perfezione now became both a counterpoint shooting out from a softly articulated pulse and a vehicle for assorted pitch and timbral adjustments and realignments. So violent was Cesari’s performance of them that he was practically head-banging, yet overall the work contains just as much restraint, Sciarrino later turning the pulse into the merest puffs of wind, and for all its motoric momentum Cesari never made the music machine-like; as with Scelsi earlier, this was something abstract from the heart. 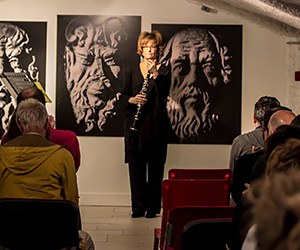 The three pieces occupying the rest of the concert displayed an intriguing common trait: material continually subject to external forces that impinge upon their stability or focus. In his String Quartet No. 7, it’s rather like a conversation sliding down a hill, its pitches and phrases continually sagging as if drawn downward by an invisible force. Experiments ensued, pitches were placed, proving to be stable until absolutely anything was done to them, whereupon they sagged once again. Even teaming up in pairs and as a united quartet didn’t help, though the music posited a solution not through effort but transcendence, hinted at briefly towards the end in soft violin tremolandi that managed to hang, glistening, in place. A similar situation abounded in Sciarrino’s 2015 work for flute and string quartet Trovare un equilibrio, è necessario? (Finding a balance, is it necessary?). Again those unseen forces made their presence felt, dragging things down. Now the players sought a more gestural, quicksilver approach, in the process seeming to move inward, enclosing their amorphous, impossible-to-resolve material into ever more claustrophobic confines. It worked: by making his substance out of musical gas and liquid, Sciarrino was here able to sculpt shapes that displayed what one might call ‘stable instability’, always volatile but such that they can be controlled and worked with, juxtaposed and intermingled. Ultimately, things began to sag again, but only as the culmination of an exhilarating exercise in wide-reaching sonic drama. And so to the end, and one of Sciarrino’s greatest masterpieces, the 12 Madrigali, composed ten years ago. Here too was the impression of influences being brought to bear on the singers’ material, though as much intrinsic as extrinsic. 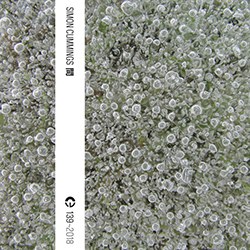 The most dazzling aspect of the piece is the way Sciarrino establishes a unique form of vocal utterance, something that combines singing and speech yet which is neither sprechstimme nor sprechgesang. It’s not only about the way words are expressed pitch-wise, but the fragmented, convoluted way in which the music is articulated, both within individual parts and as convoluted interlocution. It’s tempting to hear it, cynically, as the attempt to express something, a process continually being thwarted (or at least undermined) by these inner and outer forces i’ve referred to. On the contrary, if anything this was the most free music heard throughout the entire weekend, borne along and aloft by an intuitive sense of direction, a rapid-fire one that was prepared and able immediately to take alternate routes while at the same time ensuring all singers were working in absolute sympathy with each other. The abrupt alterations between individuated chaos and melodic/rhythmic unison emphasised this underlying order, as well as showcasing just how incredible and adept Neue Vocalsolisten Stuttgart are at negotiating such taxing material (which was originally written for them, and though it often sounds otherwise, is all precisely notated). 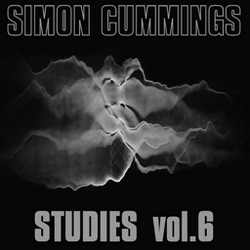 Even in the more enfeebled music that occurs in the second half of the work – supposedly a view of the first half ‘in a distorting mirror’, though this is often far from aurally apparent – an attitude of liberated abandon predominated: now pitches soared as much as sagged, they danced, they span, they flew. For all its qualifications and complexities, this was profoundly positive music; it was – and it left all of us – in the very best sense, delirious. A perfect end to a wondrous weekend of the most ambitious music-making.